This page is dedicated to one of the swinginest, rockinest, surfinest instrumental trios on the east coast, maybe even the country, maybe even the world, maybe even the solar system! Farquar Muckenfuss! They are two brothers, Dr. Tom Foolery and Dr. Harvey Wallbanger*, plus their cousin Salvadore Monilla. They'd blow Hanson out of the water any day (even though they don't really play the same kind of music as Hanson). Their sound is inspired perhaps by bands like Shadowy Men from a Shadowy Planet and Man or Astro-Man. But they are more raw, more gritty, more energetic! They have a CD out now on Burnt Toast Vinyl (vinyl? but it's a cd!) from Philadelphia. It was recorded in a barn in Lancaster on sunny weekend in July. But it doesn't sound like a barn. (There are no cow sounds.) It sounds bigger, brighter, hotter: like a beach in outer space speeding into the sun. *They have different last names, but never mind about that, they're still brothers. 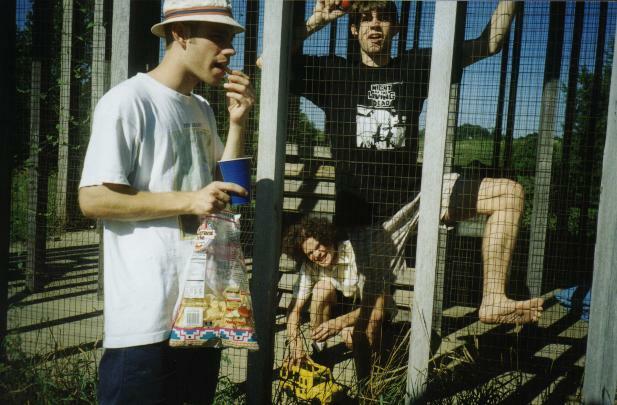 July 6, 2000 -- Farquar are on tour, somewhere in the midwest. I don't have any of the dates. Sorry. But if you live in Illinois or Indiana, check your local listings. I saw them in Elkton MD last Saturday night. Their show has gotten better than ever. They have added a smoke machine and a tiny onstage camera to the set. Plus they have a few new awesome tunes. If any of the pictures come out I'll post them. Farquar Muckenfus have an official website now: www.FarquarMuckenfuss.com. Last time I checked it was still under construction, but there is some interesting stuff there already. There was a Farquar Muckenfuss show on March 12, 1999, at the YMCA in Southamption PA. It was awesome! Have a look at these snaps from the show. You can e-mail Sal at dvalens@yahoo.com for more information. But the big news is the CD is finally out! And it sounds great and looks great too. Check out the look of the cd for yourself at Burnt Toast Vinyl's page for Farquar! Artwork for the Farquar Muckenfuss cd. 04/16/99 -- Some sad news: It looks like Farquar Muckenfuss have called it quits. They've thrown in the towel. They have said, "Goodbye Cruel World!" They've thrown the bathwater out with the baby. They are finished with the music industry and all it's trappings. But WHY? We don't know. Could this be a cruel hoax? A nasty rumour? 06/07/99 -- Happy Update: sorry it's been so long. I had been having trouble with my internet connection, but now I'm back to tell you that Farquar Muckenfuss are back together and better than ever. They had a change of heart and decided that they must make music together! Some shows coming up, stay tuned. You can hear a preview of two songs from the cd in Real Audio format and in those ever controversial MP3s at the web site of Burnt Toast Vinyl. You'll need the Real Player G2 plug-in to hear these Real Audio files. (They're in stereo! But they still sound lo-fi!) If you don't have it, you can get for free from here. It's selling like hotcakes. The title is "They Grow Their Own Meat (Grade E But Edible)". Ask for it at you favorite cool record / cd shop. 32 tracks! ! Getting Hungry? Well check out some delicious recipes from the Muckenfuss Kitchens!